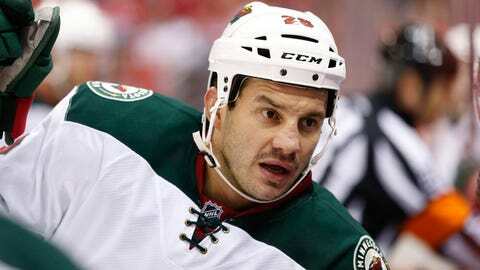 Center Zenon Konopka was claimed by the Buffalo Sabres off waivers on Friday. ST. PAUL, Minn. — Looking for two-way play throughout all four lines, the Minnesota Wild exposed center Zenon Konopka to waivers Thursday knowing they might lose the veteran enforcer to another team. 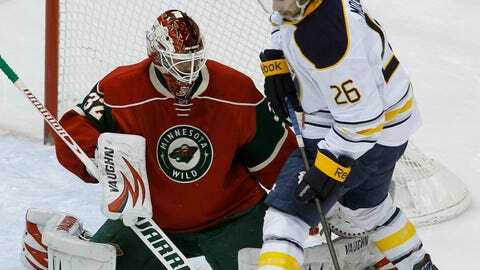 On Friday, Konopka was claimed by the Buffalo Sabres, who Minnesota beat 4-1 on Thursday night. "It was not about being prepared to move on without him," Wild coach Mike Yeo said. "I just talked to Z. I wish him luck. I think it’s going to be a good opportunity for him. But what I said yesterday still stands, we did what we had to do yesterday." Konopka, 33, had one goal and one assists in 36 games with Minnesota this season, and led the team with 55 penalty minutes. Another reason the Wild signed Konopka as a free agent in 2012 was because of his success in the faceoff circle, and he won 65.7 percent of his faceoffs this season. Minnesota has searched for consistency at center at times this season behind captain Mikko Koivu on the first line. Second-line center Mikael Granlund has returned from injury. The Wild had Charlie Coyle back at center on the third line in Thursday night’s win and Kyle Brodziak centered the fourth line. "We’re happy for (Konopka)," Yeo said. "But where we’re at with our centermen right now is, that’s kind of what we wanted to get to, is four guys that we feel can contribute both offensively and defensively. Everybody’s role’s going to be different. Let’s just put it this way. But every line should be able to go out and contribute and we like where we are with that." Konopka had two points and 172 penalty minutes in his two seasons with Minnesota. Harding still out, Backstrom to start Saturday: Goaltender Josh Harding, who leads the league with a 1.65 goals-against average and is third with a .933 save percentage, missed practice Friday and Yeo said Niklas Backstrom would start Sunday’s home game against the Washington Capitals. Harding has been out with an illness and Yeo said he is considered day-to-day. When asked if Harding, who has multiple sclerosis, is dealing with anything more than an illness, Yeo said, "I haven’t been told that there’s any reason for that concern." Backstrom snapped an eight-game personal losing streak with Thursday night’s win in goal. He made 19 saves to win for the first time since Nov. 23. "Very happy and again, the win is ultimately what it comes down to, for sure," Yeo said of Backstrom’s game. "I definitely saw some signs from his previous game that he was starting to feel more confident and he was starting to feel good about the way he was playing and that’s everything for a goalie, that confidence is huge." Backstrom had allowed at least three goals in six straight games. He just missed a shutout after the Sabres scored with 1 minute, 12 seconds left in the game. "It’s every player," Backstrom said of gaining confidence from the win. "Sure, the games you play you want to win. But things you do every day, that brings confidence to you. You know when you have done everything right, you’ve done everything as well as you can, that’s the things that’s going to make you feel confident." Brodziak "embarrassed" by strange goal: Playing through a 30-game goalless streak, Brodziak was hoping for a turn of luck to finally snap the drought. He got one in the most peculiar way possible. Late in the game, Brodziak had a breakaway attempt and was pulled down from behind as he tried to go in on an empty-net. Brodziak got credit for the empty-net goal despite the puck not going in. "I’ll take it," Brodziak said. "Yeah hopefully you get a lucky break like that and maybe your fortunes will turn around. That’s what I’m hoping for. But yeah, I don’t think I’ve ever seen anything like that before. It’s kind of embarrassing actually." Brodziak didn’t even get credit for a shot on goal, despite earning his third goal of the season. "I don’t know if I’ve ever heard the announcer say ‘goal awarded to,’ not, ‘goal scored by.’" Brodziak said. Fontaine leaves practice early: Forward Justin Fontaine went down during Friday’s practice and was slow to get up. He left the ice and didn’t return. "Yeah, he got dinged there, so just waiting for an update on that," Yeo said. "I don’t have one right now."